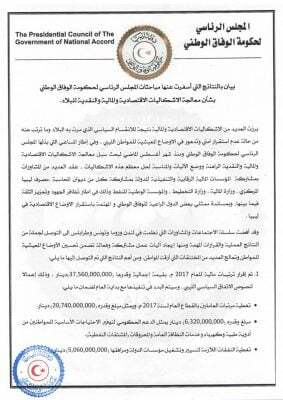 The GNA announced that it had agreed a LD 37.56 BN 2017 ”budget” with the CBL (Photo: GNA). 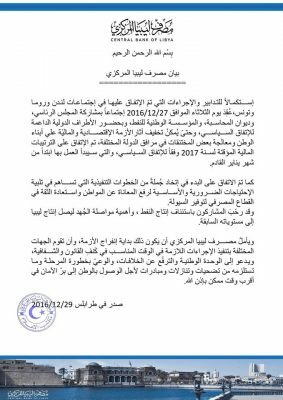 The Faiez Serraj-led Government of National Accord (GNA) and the Tripoli-based Central Bank of Libya (CBL) announced yesterday that they have agreed on ‘‘Temporary Financial Arrangements’’ for 2017. The unusual phrasing ‘‘Temporary Financial Arrangements’’ is deliberately used by the GNA and CBL to avoid using the incendiary term ‘‘budget’’ as only the legislature can pass a budget. Meanwhile, the Tobruk-based legislature, the House of Representatives (HoR) has promptly, through its Finance Committee, rejected the ‘’budget’’ as unconstitutional. The HoR accused the GNA, the executive, of encroaching on its legislative powers. 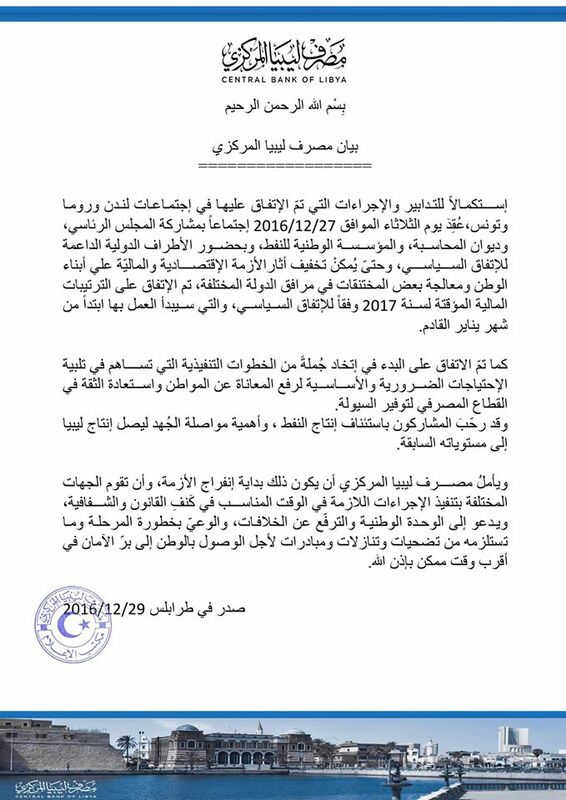 The HoR Finance Committee has rejected the GNA’s 2017 ”budget” as unconstitutional (Photo: Social Media). 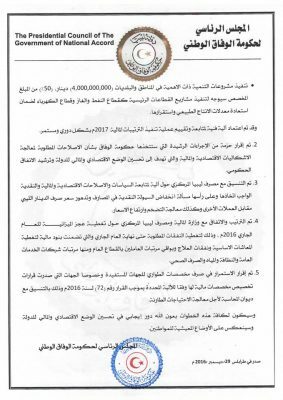 The statements by both the CBL and GNA said that a number of agreements had been reached following their meetings in London, Rome and Tunis together with the National Oil Corporation (NOC), the Audit Bureau and foreign entities supportive of the Libyan Political Agreement (LPA). The CBL announced its approval of the 2017 ”budget” (Photo: CBL). 1-An emergency temporary financial arrangement/budget of LD 37.56 BN was agreed as per the terms of the LPA. Implementation is to start at the beginning of 2017. The LD 37.56 BN includes LD 20.74 BN allocated for state-sector salaries. LD 6.32 BN is for subsidies on medicines, electricity, fuels and garbage collection. LD 5.06 BN will be allocated for the running costs of government departments. There will be LD 4 BN set aside for development projects including for regional development. Fifty percent of this, however, is to be allocated to the oil and gas and electricity sectors in order to increase production and maintain supplies. A technical process was also agreed on monitoring the spending of the budget. 2-The second point agreed on was a number of measures to reform the economy and its finances in order to make government spending more efficient. No details were revealed. 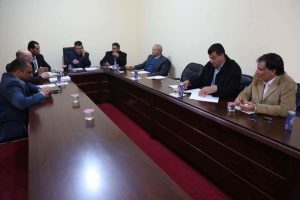 3-Agreement and coordination with the CBL was also reached on economic, financial and fiscal policies to solve cash shortages, inflation and the dinar’s loss of value was also reached. No further details on these policy measures were made available. 4-Agreement was also reached on the 2016 ‘’budget’’ deficit in order to cover outstanding payments for salaries, social security and health payments. 5-The above is to continue to be paid in coordination with the Audit Bureau. The GNA approves the 2017 ”budget” (Photo: GNA). If the agreed money is indeed made available for the Serraj GNA, it would probably be the biggest existentialist boost for Serraj and his beleaguered GNA which has been trying to operate as an executive without a budget since its arrival in Tripoli in March 2016. It must be recalled though that the GNA Ministers have yet to be approved by the Tobruk HoR and that the Presidency Council led by Serraj has yet to propose another government for the HoR to approve. 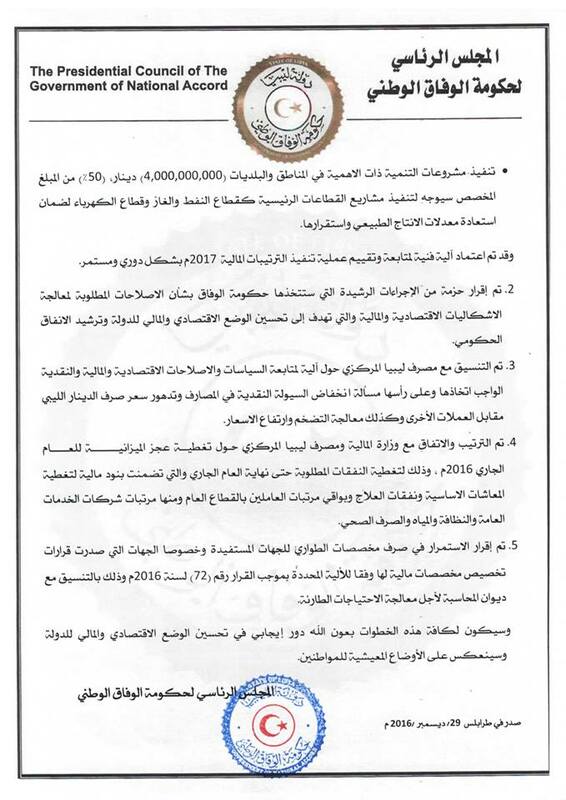 It is also unclear why after holding out for all of 2016 that the Tripoli-based CBL Governed by Saddik Elkaber has chosen to change tack and release a substantial amount of money to the GNA – without a budget being approved by the HoR.